Sally Schantz Hapenney, 82, of North Bridgton died Saturday December 16, 2017 after a short illness. Sally was born July 6, 1935 in Berwyn, Illinois, the daughter of Worth and Ruth Hamilton Schantz. She lived in Riverside, IL. until 1942 when her family, including her grandfather Orpheus Schantz, moved to Red Bank, New Jersey. Sally graduated from Red Bank High School in 1953. Sally attended Nasson College in Springvale, Maine where she was class president and cheerleader captain as well as graduating at the top of her class while receiving her Bachelor’s Degree in 1957. At Nasson, Sally made many life long friends including her future husband, Jack Hapenney. After graduation, Sally worked at Nasson College as a dorm mother, classroom instructor and in the administration office. Sally then received her Master’s Degree from the University of New Hampshire in 1960. Sally and Jack married in Springvale in 1961, where they continued to live and where their daughter Susan was born in 1964. In January 1965 Sally, Jack and Susan made what was supposed to be a temporary move to North Bridgton so Jack could coach hockey and recruit at Bridgton Academy. This temporary move lasted 53 years. 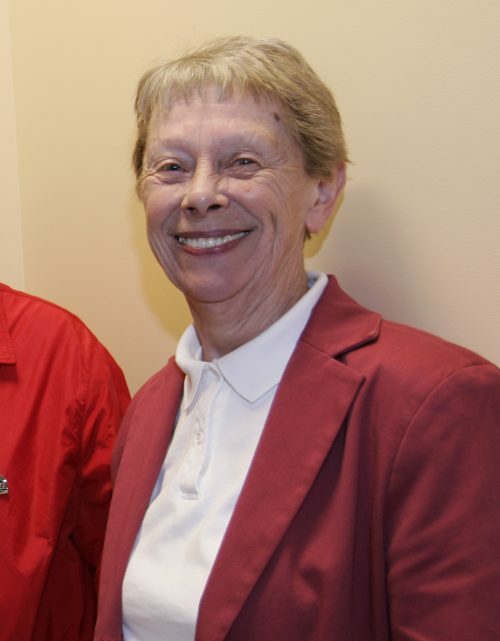 While at BA, Sally served as dorm mother in Potter House for 5 years, was Alumni Secretary, Assistant Director of College Placement and then in the role of Director of College Placement for over 25 years where she guided and influenced thousands of young men in their college application process. At the height of her career Sally had personal contact with hundreds of college admissions directors all over the US and was especially proud of her role in helping students attend the US Naval Academy and guiding student athletes through the NCAA clearing house process in their quests to attend and play sports at Division I and II colleges and universities. Sally had a knack for knowing exactly the right schools for any and all of her “boys”. In 1983, Sally was named the New England Association for College Admissions Counseling’s Counselor of the Year. Sally retired from BA in 2002 but continued to live in her home on campus and, along with Jack, was known as an “alumni magnet” Many, many alums who visited campus made it a point to stop in and see the Hapenneys to thank them for their guidance and reminisce about their time at BA. For her dedication to the school, Sally received the Ray T. Macdonald Award for Distinguished Service and was inducted into the Bridgton Academy Hall of Fame in 2009. 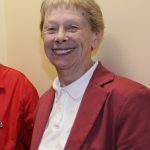 Along with her work at BA, Sally was involved in local groups including the Trustees of the North Bridgton Library, the Boards of Directors of the Western Maine Counseling Service and of the Harrison Water District. Sally was predeceased by her parents, her husband Jack Hapenney, her sister Joan Remington and her nephew Doug Remington. She is survived by her daughter Susan of Standish, her sister-in-law Joanne Drolette of Alfred, brother-in-law Leslie Remington of Fort Myers Beach, Florida as well as nieces and nephews Dale Remington and family of North Carolina, Karen Carpenter and family of Wisconsin, Philip Remington of Fryeburg, Ken Drolette and family and Robby Drolette of Massachusetts, and Andrea Berry and family of New Hampshire and Maine.